Two fingers scroll not working on Windows 10 issue is not uncommon as one of Windows 10 upgrading aftermaths. This passage introduces top 3 solutions to get your double fingers touchpad back into normal functioning for Windows 10, applying to Asus, Lenovo, Dell, Acer, HP, etc. all the same. You can try uninstalling the touchpad driver in Device Manager and then download the latest one from the manufacturer’s website to reinstall it to see if the two-finger scrolling functions back. To uninstall the drivers, follow below steps to do so. 1. Press Windows shortcut keys Win + X to open the menu and then choose Device Manager. 2. Locate your touchpad devices, right-clicking on your touchpad drivers and select Uninstall. 3. Check the “Delete the driver software for this device” box in the pop-up window. And then click OK button. 4. Reboot your computer once the uninstall is completed. Download latest touchpad drivers from manufacturer’s website. And then install them to check whether two-finger scroll not working issue solved. If the touchpad drivers are not available there for Windows 10, try downloading the latest one and save it on your local disk. And then install it in compatibility mode. Below is how. • Right click on the setup file and then select “Properties”. • Tick the check mark next to “Run this program in Compatibility mode” and select the operating system from the drop-down list. • Follow the on-screen instructions to complete the installation. Updating the touchpad driver is approved to be workable as the double fingers touch not working hitches troubleshooter. Many Windows 10 users who have encountered two finger scrolling troubles claimed that rolling back to the previous touchpad driver version and then re-updating it could hopefully revive the static two-finger scrolling touchpad. 1. Press Win + X and then choose Device Manager. 2. Expand "Mice and other pointing devices" category. 3. Select you touchpad devices and then click Properties. 4. Turn to the Driver Tab and choose the Roll Back Driver selection. 5. Restart your laptop to check whether the multi-finger functionality is returned or not. If not, please proceed steps No. 6-8. 6. Go to Device Manager and locate your touchpad devices again (Device name like Synaptics PS /2 Port TouchPad). 7. Right-click on it and choose Update Driver Software…. 8. Then select Search automatically for updated driver software. 9. Wait for the wizard to update drivers and then make a PC restart if necessary. If you would like a quick way to find and update the most compatible touchpad drivers to fix the Windows 10 two finger scroll not working malfunction, a reliable automatic driver updater utility is highly recommended, like Driver Talent, which could detect all incorrect device drivers and download the best-matched drivers with one-click in two minutes, save your time and energy. Click the button below to get Driver Talent immediately. Step 1. Launch Driver Talent, and click “Scan” to identify the problematic drivers on Windows 10. Step 2. 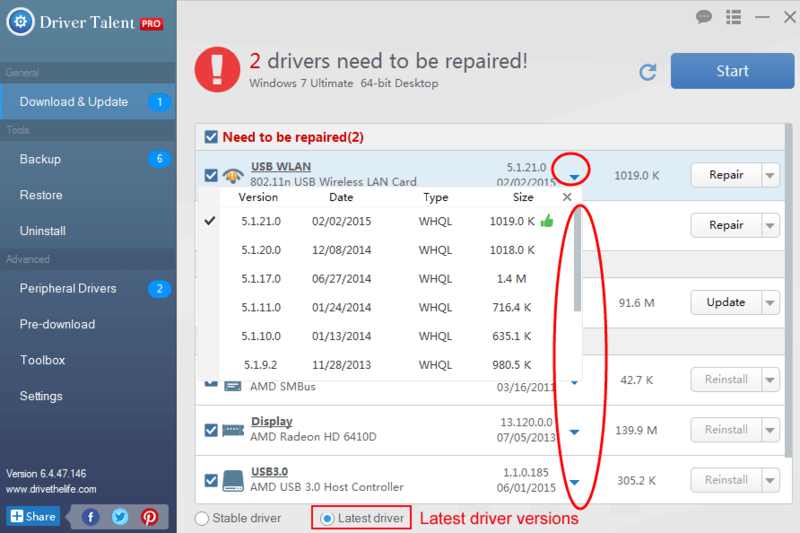 Click “Repair” to download the best-matched drivers or you are also able to click “Update” to get the most up-to-date drivers. Note: It is recommended not to update what isn’t broken in case of conflicts like Driver or Software Compatibility Issues. Step 3. Reboot your laptop to make the updated touchpad drivers take effect. A hard reset is a procedure that helps to clear the driver instructions. And after hard resetting, your laptop will reload all the instructions from the drivers and software on Windows 10. It is not an operating system reformat, thus you don’t have to worry about the data missing trouble. 1. Shut down your laptop. 2. Remove it from any port replicator or docking station and all the peripheral devices like USB devices, printers etc. 3. Unplug the AC adapter and your PC battery. 4. Press the Power button and hold for 15 seconds to drain the residual electrical charge. 7. Reinsert the battery and plug the AC adapter back. 8. Turn on your computer. 8. Select Start Windows Normally in the startup menu, and then hit Enter. You’d better perform Windows Update to update all device drivers after the peripheral devices are connected. Leave us comments if you have more questions or suggestions on two-finger scrolling not working on windows 10 issues after reading this post, or you could share us your opinion in OStoto official forum.